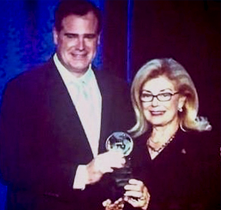 WASHINGTON, DC - Gloria Bohan, Founder and CEO of Omega World Travel, received the American Society of Travel Advisors (ASTA) 2018 Lifetime Achievement Award during the General Session on August 23, 2018 at ASTA’s Global Convention. The American Society of Travel Agents (ASTA), now rebranded as American Society of Travel Advisors, promotes excellence within the travel industry. Its awards program was designed to recognize the individuals and organizations who make lasting contributions to the industry. “Gloria Bohan is a dominant entrepreneur with a keen eye for market trends to who just somehow seems to see a little bit further than others and executes a little faster,” said Zane Kirby, ASTA President and CEO. Bohan began her travel career with the founding of Omega World Travel in 1972. She has turned her one-person office into one of the largest travel management companies in the United States and the largest woman-owned business in the Washington, D.C., area. The company provides corporate and government travel management, leisure, and meeting and event services throughout the United States, Europe and Asia. Bohan also founded Cruise.com and TravTech.com. Omega introduced the OMEGA FAMILY of BRANDS at the ASTA Global Convention. Bohan has been a member of ASTA since 1975. Her dedication to the industry has helped her achieve top accolades, including recognition in the Washington Business Hall of Fame, American Society of Travel Agents’ Travel Agent of the Year Award, one of the 25 Most Influential Leaders in the Travel Industry by Tour and Travel News, one of the Most Powerful Women in Washington by Washingtonian Magazine, Office Depot’s Business Woman of the Year, Entrepreneurial Visionary Award by the Women's Business Center, Enterprising Women Hall of Fame, and the Lifetime Achievement Award and Doctor of Laws from Marymount Manhattan College. Gloria serves as a board member for multiple organizations, including the World Affairs Council and Enterprising Women Foundation. She is a member of The Zenith Group and the Women’s Business Enterprise National Council (WBENC), and a mentor for Million Women Mentors. She is active in various civic groups, and is a sponsor of Junior Achievement. In 2015, Gloria Bohan was named the Godmother of Windstar's Star Legend, a 212-passenger ship in the Windstar fleet as well as Rivieria Cruises’ river ship, the MS Robert Burns in 2018, the first Riviera ship to have a U.S. Godmother.